Fully Loaded powerful pre-workout formula with scientifically researched ingredients in effective doses, for Extreme Energy, Hard Muscle Gains and Massive Muscle Pumps! 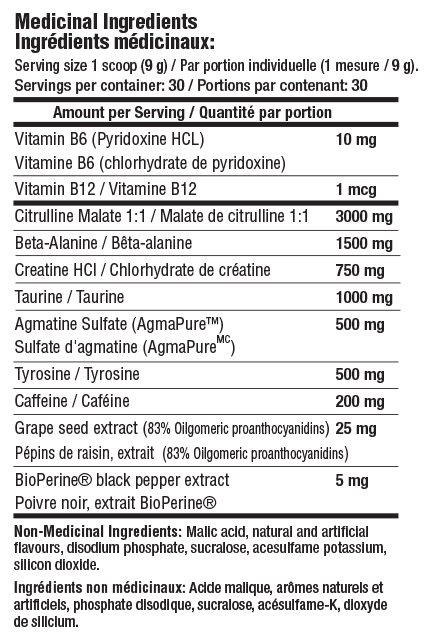 3000 mg of CITRULLINE MALATE for superior muscle pumps! 1500 mg of BETA ALANINE for increased strength & endurance! 750 mg of CREATINE HCL for greater recovery & muscle growth! 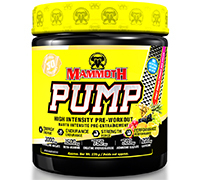 500 mg of AGMATINE SULFATE for explosive power & performance! 500 mg of TYROSINE for mood & adrenal function support! 1000 mg of TAURINE for improved focus & alertness! 200 mg of CAFFEINE for longer lasting energy! Adult Dose Take 1 serving (9 g) 1-2 times per day. Add 1 serving (9 g) to 6-12 oz water, mix well and drink. Consume 45-90 minutes before exercising. Not to exceed 1 scoop per dose. Helps the body to metabolize carbohydrates, fats and proteins. Helps tissue formation. Helps to form red blood cells. Workout supplement. Athletic support. Source of amino acids involved in muscle protein synthesis. Helps to relieve fatigue, to promote endurance, and to enhance motor performance.